The HoM awards went to Martin Wright and Mark Mon-Williams. Congratulations to them. They will receive technical running gear from HoM sponsor UP & RUNNING. Martin Wright completed his 5th marathon in 5 weeks, finishing in 4:12:38 at Lausanne, raising money for Cancer Research UK. John Hayes reports ... By chance (well, in fact, with a bit of skilled manipulation on my part) we were up in the Guisborough area at the weekend which allowed me to take in this race on the Sunday. Sarah and I ran round the route at a leisurely pace on the Saturday. In many ways, this is the way to do it as the summit of Roseberry Topping (a sort of North Yorkshire Moors mini-Matterhorn) demands that you stop to admire the stunning panoramic view. The fell race itself sets off at a frantic pace and stays that way all the way through! It takes in lovely scenery around a great route and is run by very friendly local organisers. This makes the Three Tops something of a gem of a fell race which I recommend to all Harriers. Ken Souyave reports ... after 2 1/2 hours of difficult mountain biking in Gisburn on Friday I decided to cross into Lancashire again to do this road race. A well organised event though not a particularly attractive route. Long ups and down make this a relatively difficult course but nothing severe. 350 runners with the winning time 33:30. I was 39th in 41:25 and nice to get back on the road after the interesting experience of Withins!! First report from Dave Wilby ... Looks like a few Harriers were in the prizes at OMM: Hector Haines & Jack Wood in Elite (awesome!! 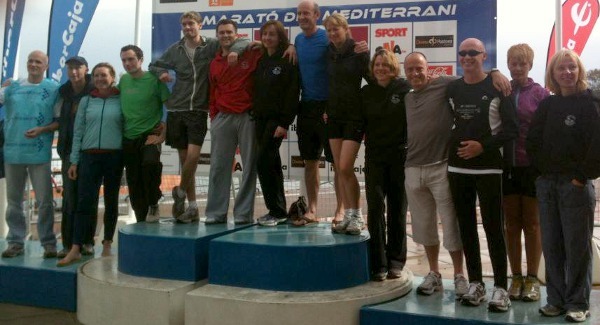 ), Stuart Pitches 6th in A class, Mark & Rebecca Mon-Williams in A class, Outi K plus Peter & Chloe Haines in B class. Probably more too. Grim day all day yesterday, better today. Toughest race of the year so well done to all. Rebecca and I had the great pleasure of running through beautiful Scottish woodlands with a pack of Ilkley Harriers yesterday afternoon� Stu Pitches plus Peter and Chloe Haines � as we descended from the penultimate control on the OMM. 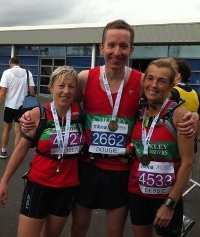 We even had Stu shouting �come on Ilkley� as we ran down the hillside � inspirational! The preceding 30 hours were distinctly less pleasurable... Rebecca had decided to set us a challenge earlier this year and signed us up for the A class in the OMM (I was thanking my lucky stars as we went around that she had made the decision and not me). We were allocated to the first start of the day so duly got on a bus in Comrie at 7am, were dropped off at St Fillans at 7.30 and walked uphill to the start for 8am. It was clear at this time that the conditions were going to be poor with low visibility, rain and a cold wind. But it wasn�t clear that these conditions were going to get much worse (to us or the dismal BBC weather site). So off we set on our course. Bizarrely the planner had decided to make the A course a similar length to the elite on the first day. On Sunday we realised that the plan was to differentiate the courses by making the A course considerably shorter than the elite on day two. Of course the assumption in this plan is that people survive day 1 to get the benefits of a shorter day 2. Sadly this was a deeply flawed assumption with very tough terrain and dreadful weather conditions producing a terrible attrition rate! Thus, Rebecca and I found ourselves suffering for 9 hours and 4 minutes on day 1 with the whole day feeling extremely tough � our simple strategy was to just worry about the next control and try and ignore the pain! We eventually finished and crawled into the camp exhausted, threw up the tent and shoved food down our necks. A couple of hours later we were shocked to find that we were lying in 15th place overall and 1st mixed couple � but most shocked that only 35 teams had finished (there were supposed to be 183 teams on the course!). Moreover, it was fantastic to see that Stu had a brilliant run to lie in 6th place and great to find superb results across the classes from Ilkley Harriers � Hector and Jack in 6th place on the elite, Dave in 14th position, Peter and Chloe first mixed team and Outi in the first ladies team on the B course plus Joyce and Nicky and Kevin and Rachael well up the rankings. Rebecca had been threatening to resign from running but the great IH results made us think we should probably turn up the next day (though we were petrified that it would be more of the same). Day 2 was mercifully a very different kettle of fish � the weather was clement, our course was much shorter (though Rebecca�s initial delight at the start line was destroyed when it became apparent that they�d given us the D class map by mistake). The start was 1.5km from the camp and we didn�t allow enough time so we were still packing our kit as our race started � this also caught out Peter and Chloe who started a few minutes after their allocated slot. Rebecca and I were being chased by Colin Brash and Jo Schrieber who were the second mixed couple 6.5 minutes behind. This made for an exciting day- especially as they caught us on the way to the fourth control (which necessitated a very horrible race up an extremely steep heathery slope with frantic glances between teams). We were fortunate enough to steal a minute from Colin and Jo on this ascent and then ran scared all the way to the finish. Sarah Rowell had advised us that the race would be won or lost on navigation so we tried to hit everything cleanly which ultimately culminated in us meeting the pack of Ilkley Harriers and managing to cross the line ahead of Colin and Jo (though not 100% certain of this until sometime later when the results came up). Amongst the many fine junior results, Georgia Malir won the U17 race, Sarah Pickering was 3rd U13 with Ilkley 3rd team, and Francis Westhead and Ilkley won the 1st race of the day, in the U11 race. 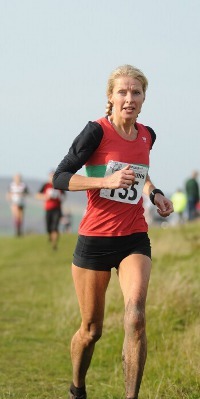 Report from Alison Weston... Ilkley Harriers fielded a good number of runners back at Kettlewell today for the Great Whernside race which was the Yorkshire Championship race this year. No Yorkshire Championship medals for Ilkley but good results none-the-less, with special mention to Norman Bush taking 1st Vet 70 (and also Vet 60 I believe). This was a IH League race. Lots of Harriers young and old at the first of the Woodentops races. Lots of photos on woodentops.org.uk, our results below .. (we hear we missed the ladies team prize by just 1 point). An intrepid band of Harriers popped over to Barcelona ... read Sue's snippet. John Coates was 29th in 41:31 at this Ogden race. From Neil Smith ... The Lakeland Classics Trophy was established in 2002 with the aim of encouraging participation in long category A Lakeland fell races. Six races are included: Duddon Valley, Ennerdale and Wasdale (categorised as Super Long), and Borrowdale, Three Shires and Langdale (usually categorised as Long, although Borrowdale was classed as a Super Long this year since the date for Ennerdale and Duddon clashed). Three races count towards accumulated points but at least two must be Super Long races. Points are awarded based on finish times rather than positions. Ilkley was 16th team this year, with points from Duddon Valley, Borrowdale and Langdale counting. 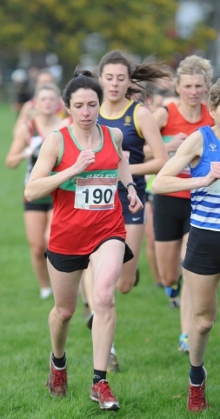 Clare Smith was 15th in the L/LV40 category, having also run at Duddon, Borrowdale and Langdale. From Sally Malir ... Georgia Malir had another fantastic run on Sunday in The English Schools fell running championships. Georgia ran her heart out to gain a FRA bronze medal against some very stiff competition, she even fell in some woods and had her shoe fall off but let nothing deter her from receiving a medal! The races were in Cockermouth Cumbria and involved juniors from years 7 to 13. There were 340 competitors and all courses were testing. Georgia's race was 4 miles long with steep climbs and muddy decents. She was 3rd girl, 23rd overall out of 76 boys and girls years 10 and 11. From Alison Frost ... Palma de Mallorca Half Marathon A wonderful well organised race and all round great experience in the sunshine. What better way to spend a sunday morning followed by cava and tapas! Sharon Meadows reports ... Another beautiful day for this sometimes scenic, sometimes not 50 mile trail race. This is a really well organised race with lots of food and drink stations and a meal at the end, everyone is very friendly making this an ideal event if you are thinking of doing your first 50. The terrain is mainly track and fields with a bit of road and it's slightly undulating not too hilly, so it's very runnable. Results from Sportident below (thanks Clare), Graham Weston's photos here, more photos on Sportsunday. 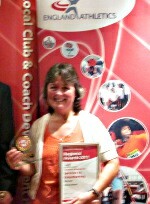 Well done to Shirley Wood, who was presented with a top award for 'Services to Volunteering' by England Athletics. Shirley is, of course, the driving force behind our massively popular and succesful junior section at Ilkley Harriers, but has also helped support junior athletics more widely through her work with the Bradford Athletics Network. Toni Melechi reports ... A baptism of mud, wind and rain awaited Tilly Melechi on the Oxenhope fells. In her first ever outing in a Harriers vest, she finished first U14 in the three-mile race, only 1 second behind the winner of the senior ladies. From Ken Souyave ... the BUPA Great Yorkshire Run is a large well organised event on a relatively flat course but with a sting in the tail with 2 climbs in the last K just when at your weakest. Slight headwind out but the rain held off. I ran 40:59 and was first vet 60. Didn't spot any other Ilkley Harriers. This would be a good event for the regular 10K road runners as similar to Abbey Dash. Dave Wilby reports ... 14m/4000ft, offering one of the finest courses in the fell running calendar, the Langdale Horseshoe is the traditional end of season farewell to the long lakeland races. It proved as popular as ever this year, with 500 entries being taken in advance, including a bumper crop of 16 Harriers all up for the challenge. A terrible weather forecast may have curtailed a few ambitions, but those that turned up were treated to a gruelling yet glorious race requiring the full range of fell running skills. The weather was largely fine on the day, although the course was frequently shrouded in mist, and the underfoot conditions were soggy to say the least. A combination of soft boggy ground, and greasy boulder fields saw a large number of competitors returning with superficial war wounds, and a couple with slightly more serious injuries, but luckily the Harriers seemed to get off reasonably unscathed and all I spoke to had enjoyed their day out. Over 620 Primary School children competed in the first race in the Wharfedale Primary Schools XC League, including many junior Harriers and their litle brothers and sisters, and many from Harriers families. Results on the junior pages. Commiserations to the ladies' team - running well enough for 3rd place but for a punching error? resulting in disqualification. We've had an unlucky few years on IHMR, with the men's team suffering injury last year. But well done to everyone on strong runs. Hopefully a full report in the newsletter. Henry Heavisides reports ... it was a bit too hot to run a half marathon today in Brussels (28 degrees), but nontheless 5261 people completed the course. I was 201st in 1:31:02 (3rd M55) - just happy to get round without dehydration or injury. Val Kerr reports ... this hilly trail race covers 17.1 miles of the 30 mile Sandstone Trail in Cheshire. Most of the 2150 ft of ascent takes place within the first 7 miles where the long distance footpath follows the sandstone ridge through deciduous woods and past two historic sites, Peckforton and Beeston castle. The A race then joins up with the shorter 10 mile B race at Beeston to follow the footpath over fields for the next 5 miles, with runners having to negotiate many stiles and kissing gates along the way. The race has a final sting in the tail at 12 miles, with several smaller but significant climbs, mainly on loose sand worn away from the sandstone, before dropping down to the finish in Delamere Forest. I had my own personal reasons for doing this race and was pleased to get to the finish on what turned out to be a very warm and humid day.